We’ve been enjoying blissful September Seattle weather. Mild and sunny during the day, crisp and cool in the mornings and evenings. That’s why downtown Seattle evening life has been bustling as locals make the most of it before the rain sets in. Greg snapped these photos just before we met friends for supper at the Umi Sake House in Belltown. I needed a cheerful outfit to match the great weather and my happy Japanese-food-eating mood. This skirt makes me happy for a myriad of reasons, so that was a no-brainer. It was also nice to wear it one more time before it hibernates for Autumn and Winter. I LOVE the way soft full skirts swish, float and move as you stride. It feels romantic, ladylike and carefree, all of which adds to my good mood. I usually wear my skirts with one of my wardrobe essentials: A tucked button down shirt, a camisole with half buttoned up denim jacket, or a turtleneck either tucked or untucked. 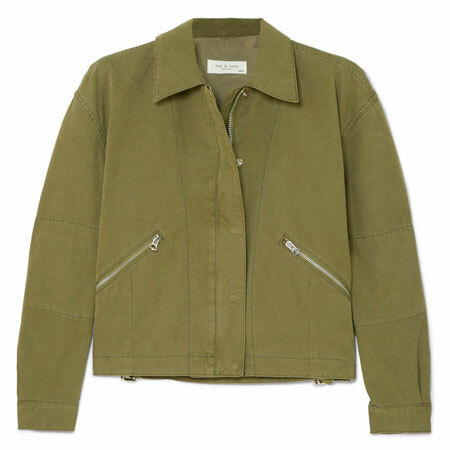 Of course, I also pair my skirts with blouses, statement shirts, knitwear, and jackets, but generally prefer a wardrobe essential because the combination is easy, minimal and simple. In this way I never have an orphaned skirt. 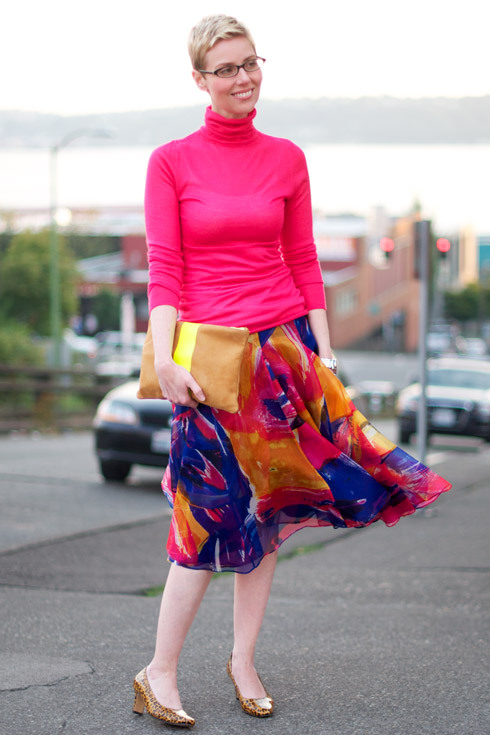 I’ve had this lightweight, gauzy, neon pink silk turtleneck for years and, quite coincidentally, it matches the skirt. 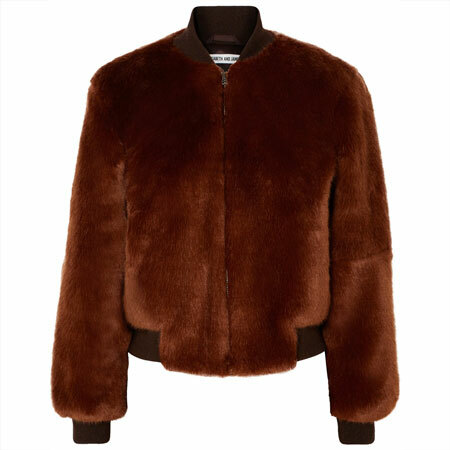 Now and in Spring is the perfect time to wear it because it isn’t that warm. 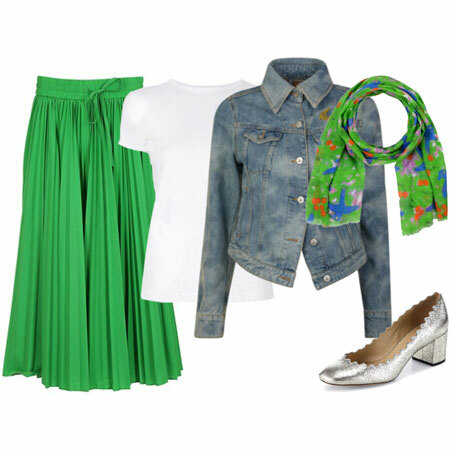 The rolled collar and hem give it a casual vibe and appropriately dress down the skirt. Scrunching the sleeves relaxes the look even further. I finished off the outfit with low heeled orange animal print pumps to pick up the orange in the skirt and to throw in some pattern mixing. 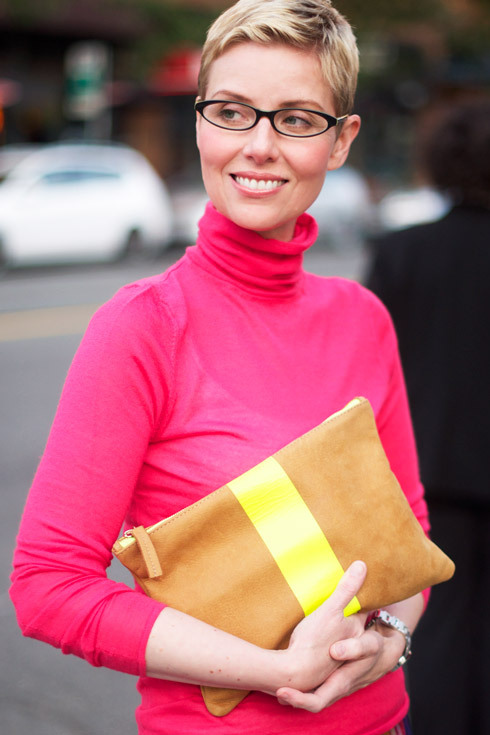 And my neon and cognac clutch just because I’ve fallen in love with neon yellow matched with neon pink all over again. For me, those are fun early ’80s flashbacks. No jewelry apart from wedding ring, watch and specs. This is a very, very bright outfit. Too bright for some, and my apologies for hurting your eyeballs. But I do love my brights and feel as comfortable wearing them from head to toe as I do wearing a more subtle, neutral outfit. As long as the outfits in both colour spectrums are simple, minimal, modern and crisp, they both feel at home in my style persona. Lovely outfit! Love the colors! Love the airiness of the skirt and the simplicity of the unlayered outfit pieces. I can do looks like this but have to back away from all the linear looks you pull off so well, lest I look like the South Park bundled up cardboard stiff cutout figures. I particularly love your thoughts on matching wardrobe staples with skirts and how that avoids having an orphan. This suits my way of working but just reading you say that makes me feel more relaxed about that kind of pairing being ‘enough’ on its own. It also makes me realise I need to upgrade my wardrobe staples now to make that formula really work. Thanks for that insight. Love the photo with the background in black and white especially! Love the splashes of colours and and the pattern mixing going on here. What a cheerful outfit. Thanks for posting this, Angie. I really like your tips on how to wear bright colours. 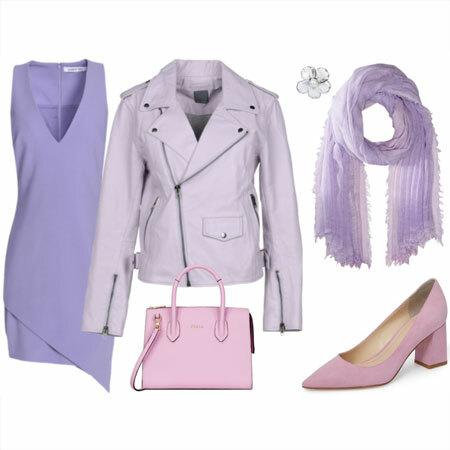 I love to wear bright colours but find it a little hard to put together an outfit with such class and sophistication. What a lovely ensemble, Angie. Even though I personally bat for Team Neutrals, I love seeing what you do with color, Angie! What a pretty skirt! I love the way it swirls in the breeze. It looks great with the animal print shoes and simple clutch. Hmmm, how can I copy this look? Thanks for posting another great inspiration photo! Angie I love this skirt, and I think of your mum when I see it:). This is a beautiful outfit. The simplicity of it balances the incredible explosion of color and my eyeballs are loving it! Gorgeous! I haven’t seen you in bright pink, and it is wonderful for you, Angie. Love the animal print shoes as a happy surprise! Sigh… I am so in love with the skirt!!! The skirt is gorgeous and timeless but the shoes and clutch make it now. Beautiful! So pretty and ladylike, and then the clutch and shoe choice give it some bite! Pretty in pink! That skirt brings back such fond memories. Love the textures of the skirt, too. You look lovely in your brights, Angie! And it’s fun to see you wearing a top untucked. Enjoy the rest of September weather. I can feel the happiness in your stride in that beautiful skirt and bright outfit. Kudos as always to Greg for capturing the essence of the moment spectacularly such that one is transported in time an dplace to the exact spot you are standing, as the breeze gently moves your skirt! As always Angie, I am left to marvel at you fab sense of style. I love how you had such a colorful outfit without seeming garish or over-the-top! I so love that skirt! Awesome outfit, I love the bright colors. 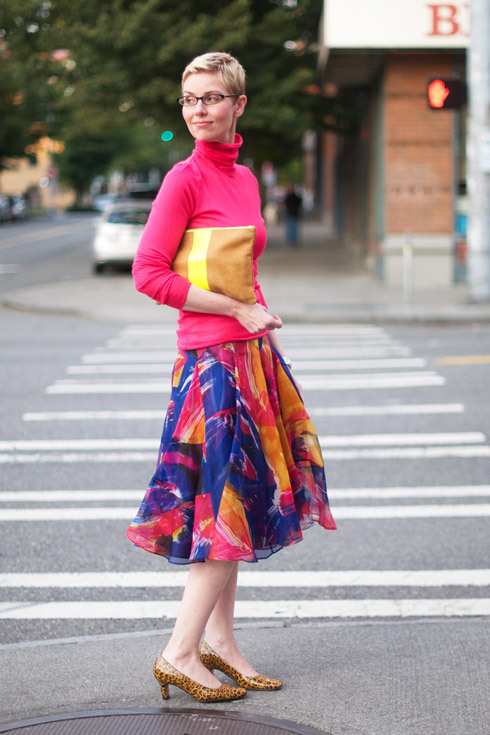 You look radiant in the bright pink The turtleneck gives it a non-summer look – perfect! The graphic stripe is a brilliant juxtaposition with the floral print. Made me happy this morning- the glory of your style!! Who knew pink and bright yellow could work in such a sophisticated combination. The subtle neutrals in the shoes and bag are just the right amount. Absolutely beautiful! I love this, Angie. That skirt is so fantastic. Angie, you couldn’t hurt my eyeballs if you tried! This is beautiful! You are like the last flower of summer! such a fun outfit! Love the colors! You can wear that very same outfit on the first day of spring! It is perfection! Fun bright outfit, my favorite is the black and white photo with only the bright outfit in color, neat! The one thing about bright clothing, you can’t help but feel happy wearing them! Such happy colors. You look lovely! Gorgeous, breathtaking, gosh please pass the smelling salts I love the sheerness of the turtleneck and how the white cami peeks thru. I am into sheer materials big time right now! And the clutch is divine! I love this bright, happy outfit! So beautiful! Probably I feel more attracted to it because I’ve been loving that shade of pink myself.But the skirt and the turtleneck with the shoes and bag are such a beautiful combination and so unique of you Angie.Love it. Angie you look divine! And it makes me particularly, weirdly satisfied that you pulled out this old(er) turtleneck and it matched your new(er) skirt! Kind of like when I manage to find exact change for the cashier (I’m a kook I know). By your gentle and excellent example, I’m finally starting to get how to pair essentials with statement items, like this skirt. Even though your turtleneck is pink, it’s till one of your essentials and it doesn’t steal the attention from the skirt’s print. The shoes and clutch are a sophisticated counterpoint and I’m trying to learn how to incorporate items like that as well. I’m glad you’re having some glorious fall days. Soak them up for me, too. This outfit makes me smile, Angie! What fun colors and I love how the animal print shoes and the clutch sort of tone down the brightness and make the whole outfit come together in that special “Angie” way. Oh Angie, this outfit is sublime on so many levels. I’m most inspired by your pumps + clutch choices. Brilliant! Oh Angie you look adorable! Oh this is WONDERFUL! The bright pink is unexpected on you (for me at least) and it is such a lovely surprise. That turtleneck is the perfect match for the skirt, I love the hem against the flouncy skirt. And the animal print shoes and clutch are brilliant accessories. This is something I would have never ever thought of putting together and it is amazing. You’re the style maven! I love your skirt! I wish my black and white polkadot skirt was swishy like yours. Seattle is so lucky to have you, Angie. Just beautiful. And while I can’t wear bright colors, I love, love seeing them on other people. And Greg, that last photos is killer- the Angie and her brights against the black and white- brilliant . Love it all, including that Clare Vivier clutch!! Chic and crisp, my eyeballs feel great! Such a lovely outfit and happy colors! I love it all!! You look radiantly beautiful Angie – shoe selection is genuis! Good-bye summer! You’ve given the season an unforgettable send-off! Angie, you have truly captured the mood of our lovely summery September! I am quite reluctant to pack up my summer clothes due to the warm westher and your beautiful outfit has just confirmed my desire to extend the season. So lovely and vibrant, so Angie-like! I adore everything in this combination, the items are equally beautiful alone and together. Those pumps are gorgeous, and so are the skirt and bag, and the turtleneck so soft and slightly sheer – just perfect! Splendid and gorgeous! Angie, you are the best! I have a neon pink cardigan but I am in doubt if I can wear it to work (I’m a teacher at school). Can you advise anything? Oh gosh. I’m blushing big time. Thanks, everyone! Glad that your eyeballs are feeling fine. Vildy and Claire, you crack me up. April and Sinead, thanks for appreciating brights on me when it’s so not your thing. Deborah, I’m touched that you remembered my late Mum. Patti and Antje, I LOVE shockingly bright pink and should wear it more often. Cloud9, fond Pasadena memories indeed. Greenglove, we always appreciate your artistic viewpoints on outfits. Lisa, what is it about bright happy colours that make us feel even happier? It’s so true. Laura, you hit the nail on the head with the ease involved of sticking to a particular colour palette. Tat, how about with grey bottoms and a scarf to tone things down? If I saw you on the street I would stop you and tell you how stunning you look! Very much up my style alley Mrs. Cox! Angie, you look so gorgeous, and happy, in that outfit. I’m sure you lit up the street. You’ve certainly made me smile. What a beautiful outfit! You look wonderful in those colors. Ooo, I feel so wonderfully Angie-esque as I read this wearing my neon pink BF shirt with jeans and animal print ballet flats. You are vibrant in this setting and Greg’s photo shoot is once again spectacular. As usual, I love hearing the variety of ways you can add to this, or any, skirt. A toast of sake to you as you celebrate the ending of one season and the beginning of another. Gorgeous – what a way to send off summer in style. I love the combination of bright yellow and pink. I’m off to see what I can come up with in that combination in my closet. Thank you for continuing to inspire and dazzle us with your style and sense of fun. You are beautiful! So pretty! I love this bright outfit on you for our nice September weather. This outfit is absolutely magical, Angie. 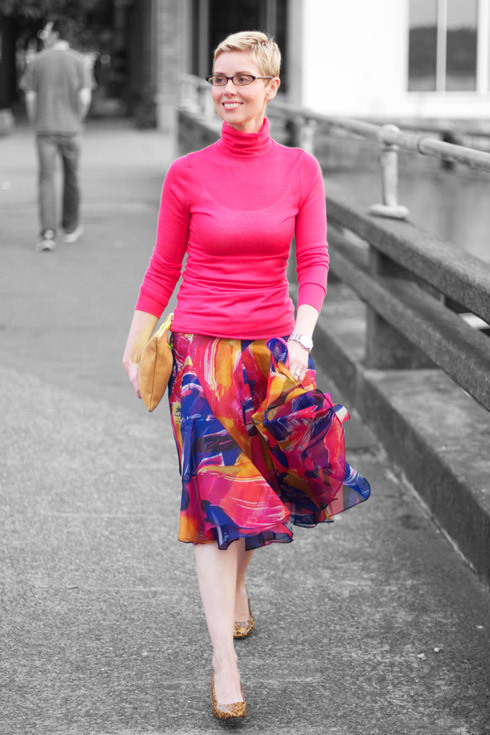 These bright colours are just dazzlingly beautiful, and that shocking pink turtleneck (so so flattering on you) was made for this skirt. This is ladylike elegance with happiness factor 500. And I keep looking at your animal print shoes and neon and cognac clutch, they are a very unexpected touch yet suit this ensemble perfectly: they pick up the colours and add depth and interest. Only you could think of this. This is going straight into my inspiration folder and on my pinboard! Also: Greg’s pictures are fantastic, the vibrancy just jumps off the screen. What a beautiful, happy outfit! 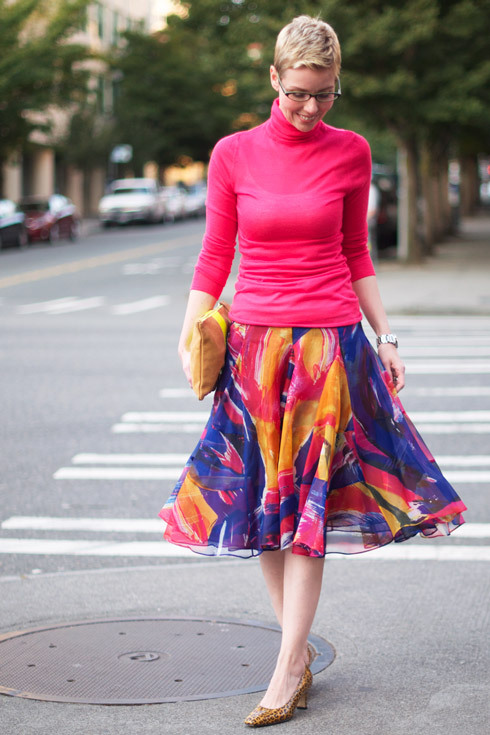 I love how you pair a wardrobe essential with a fun skirt. I need to take this lesson to heart so that I don’t orphan my skirts anymore! Lovely Angie, and I note that the clutch adds a special touch to the simplicity of the plain top-perfect! You look so pretty and happy Angie! I love the way this outfit is classic using essential pieces. Yet the color, pattern mixing and accessories/shoes are trendy. Trendy everything would be OTT. What you said about wearing skirts with essential tops like button downs or t-necks so as to avoid orphaning skirts is truly instructive; I’ve committed that Angie lesson to memory. And I love that clutch… I’m going back to read the comments to see if you’ve released any details! Claire Vivier clutch? 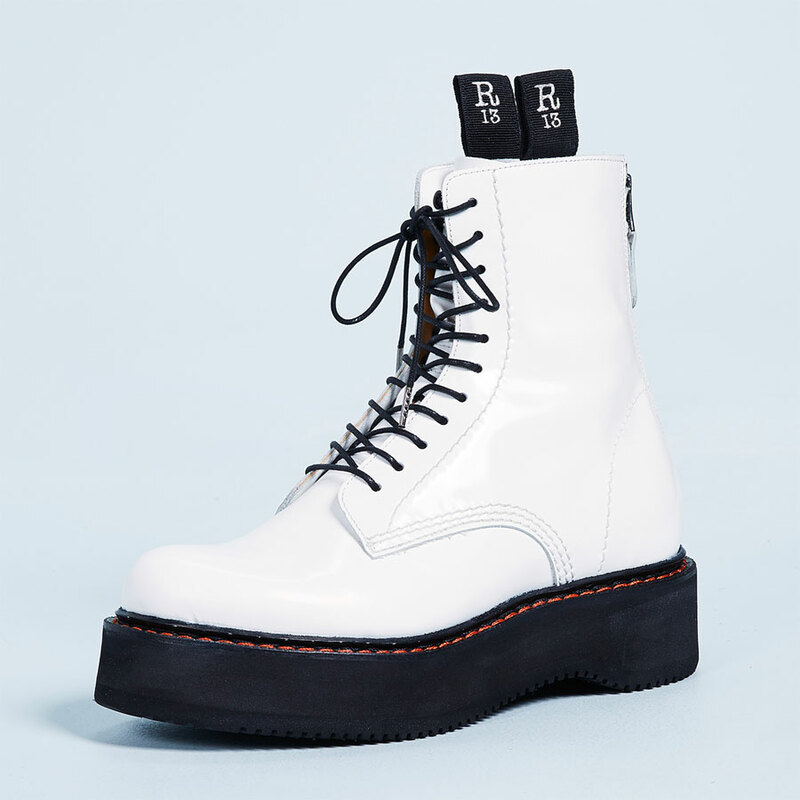 I looked it up on Shopbop but theirs are fold-over. You look so vibrant and full of life in this outfit! The hot pink comes across as elegant and sophisticated on you, and the soft draping of the skirt is really lovely. I love how you tied the camel of your handbag to the warm tan of the leopard pumps–style serendipity! It must have been so fun to put this outfit together, and I’ll bet you garnered lots of smiles when you were out and about :). Oh, yes. You are making fall jealous! Sophisticated and classy with a bit of edgy pattern mixing and neon for good measure. Sublime. The addition of the bag and shoes is unexpected genius. Pushes the whole outfit into the fab stratosphere. And I LOVE a turtleneck. Gorg. so pretty! bright but looks great. your blonde hair helps. can the skirt not be winterized? Angie, you look wonderful as usual.Turtlenecks or V-neck knits with skirts is my favorite combination. But since the baby ( and its pooch), I dont wear fine knits. As they stick to the stomach. How do I alter this combination for an apple shaped body? I love skirts of these sort as they go both in spring/summer and into fall with boots. Love it!!! These bright colors just make me so happy! Wow, Angie, this is so beautiful and I love the care-free flowy-ness to it. I can just imagine you gliding down the street, such a vision. 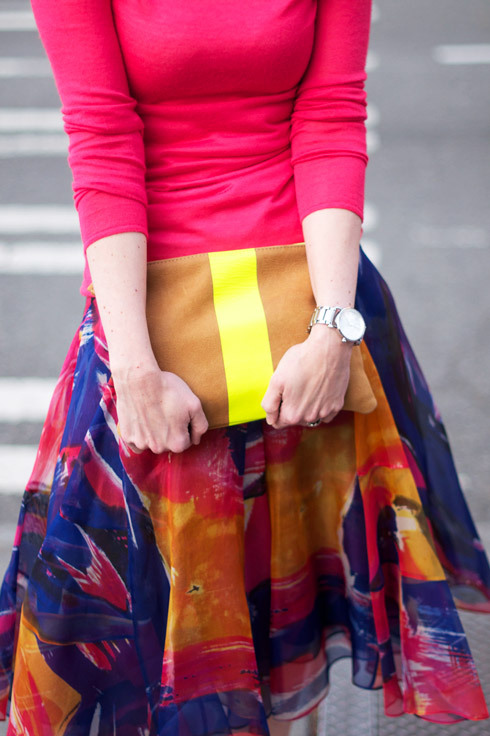 That skirt is stunning and love the pairings. Inge, I’m humbled to be pinned. Cocolion, the clutch was a gift from a dear friend, and it’s a Claire Vivier. 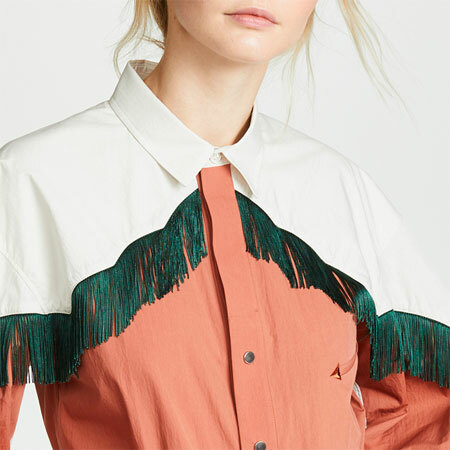 Rutuja, how about a woven shirt. Try Foxcroft. Or size up in tailored knitwear. Mellllls, the voile fabrication of the skirt is too “warm weather” for my tastes. I’d prefer that this skirt hibernates in cold weather. This is so lovely and vibrant. The attention to details is a valuable lesson to remember. I was also reminded of your dear mother seeing you in this skirt. Angie, I adore every outfit I’ve ever seen you wear with that skirt. It is SUCH a gorgeous statement piece, and pairing it with leopard print shoes was such a creative move! And a final farewell to my skirt until Spring 2013. Autumn has hit Seattle and the temperatures have fallen.